This is one of the best dating books I’ve ever read. 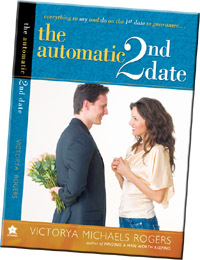 The Automatic 2nd Date is more then just a single woman’s “How to Guide” on successful dating. It gives you the tools to explore what you really need out of a relationship and unlock your special sparkle within. Had I known these skills at a younger age, I would have been married ten years earlier. Automatic 2nd Date is very insightful. It's just what I needed right now. Much of it is so poignant especially in today's dating society. These are tools that anyone can apply." Peri Bay , single girl in L.A.
Like a conversation with a girlfriend, Victorya shares practical and specific ways to attract the man of your dreams, and keep him coming back for more. Through her own stories of success and failure, she offers proven confidence-building methods that will not only improve your dating life, but all of the other relationships in your life as well. Do you want the honest truth on making a positive first impression? Victorya Rogers equips you with the inside scoop on everything you need to know in order to get that desired second date. Sensible, practical and intuitive, this is the perfect handbook for success in building healthy and meaningful dating relationships. Automatic 2nd hit! Victorya captured my attention on the first page and I was hooked! I already have a list of friends I'm giving this book to. I especially love the action points and journaling at the end of each chapter. Great job Victorya! No wonder you're married to such an amazing man! If you want to have the self-esteem, the self-confidence, and the courage to attract and keep the man that you AND your mother always wanted for you, this is the book for you. This entertaining, educational, and insightful book offers practical advice equivalent to months of psychotherapy. Victorya Michaels Rogers has a magical way of communicating. She shows you how to become the person you've really been all along. I couldn't stop reading it! Everyone who is single must read AUTOMATIC SECOND DATE! Every mother of a single should read AUTOMATIC SECOND DATE so they can advise their single daughters! Great advice for those who desire relationship from single expert Victorya Rogers! Imagine that you've just received a call offering that heart-stopping first date that you've always dreamed about. Now you have to make an impression that will snag the second. In The Automatic 2nd Date, former Hollywood agent and talent scout, Victorya Michaels Rogers gives you a total makeover--spirit, soul and body. In classic Victorya style, she will leave you inspired, she will leave you transformed and she will leave you laughing. She will never leave you unchanged. This book is a must for every single woman. I learned a lot from Automatic 2nd Date and certainly will share it with quite a few people that I know will benefit greatly from it. This great book offered me HOPE. With humor, wisdom, and encouragement, Automatic 2nd Date gives me much insight and confidence that there IS someone else out there for me. It will do the same for you. " Dating Coach Victorya Michaels Rogers is a former Hollywood agent who went on more than 100 first dates with 98% of her dates asking her out for a second. She earned her bachelor's from California State University at Long Beach and her master's from Fuller Theological Seminary. She has appeared as a guest on television and radio and speaks across America . Victorya lives in a suburb of Dallas with Will, her husband of 10 years, and their young children, Matthew and Katie. .